A Christmas log is the traditional dessert for the French Christmas meal on the 24th of December. 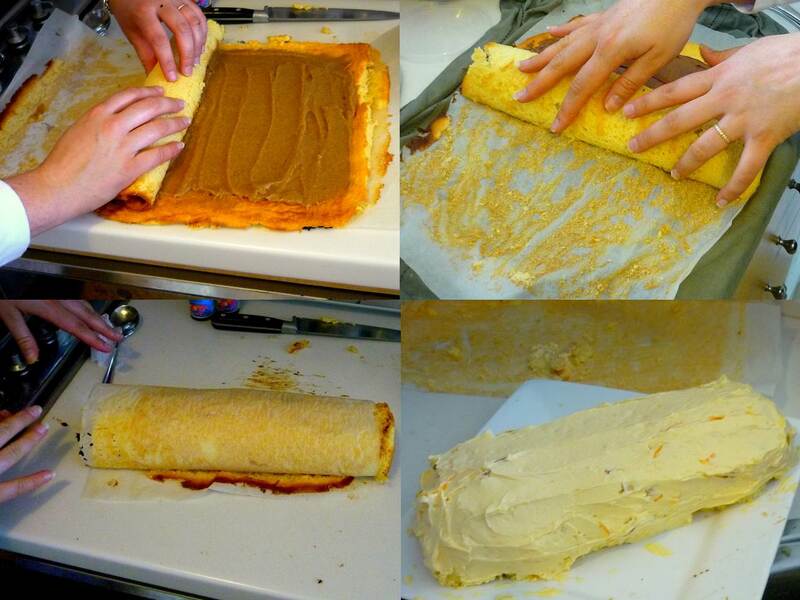 It is a rolled sponge / Genoese sponge in the shape of a log, most often with chocolate ganache inside or chestnut cream and icing on the outside to make it look like a log ready for the fire. In Provence there is an entire ritual revolving around a wooden log in the chimney that is carried three times around the table by the youngest and the oldest members of the family, sprayed with wine and meant to burn for several nights. It is believed the Christmas log is originated from this custom. The ingredients suggest it’s most likely a 19th century creation. 200g 85% dark chocolate and 1 tin of sweetened chestnut puree (Faugier is a good brad), 10 cl of chestnut licqueur, 125ml double cream. You will also need a sugar thermometre. Make sure the ingredients are weighed out exactly. Beat the butter until a smooth, creamy consistency is obtained. Put the eggs and extra egg yolks in a large mixing bowl and keep to one side. In a saucepan put the sugar and water and heat over a medium heat until it reaches 121℃. Take off the heat and when it goes down to 110℃ start whisking the eggs with an electric mixer and whilst whisking non-stop gradually add the sugar mixture in a steady stream. Continue to whist the eggs until the mixture is luke warm (about 5 mins). Add the butter to the creamy egg mixture and whisk for a further 5 mins until a smooth pale creamy mixture is obtained. Cover with cling wrap and place in the fridge to harden. To make this light airy sponge you need to make a bain marie by placing a large mixing bowl over a saucepan of boiling water. Meanwhile, heat the oven to 170℃ (less if fan assisted). Prepare a swiss roll tin or baking tin with shallow sides with non-stick baking parchment. We used an oven tray lined with paper which worked well, you don’t want it to be too thick otherwise it is hard to roll. Weight out the flour and sieve twice with the salt. Put to one side for later. In the mixing bowl put the eggs and sugar and keeping the bowl over the saucepan of simmering water, whisk continually until the mixture is light and creamy and very thick. You should be able to see the trail of the whisk after moving it through the mixture. Take off the heat and continue whising until cool. Carefully fold in the flour with a large metal spoon then spread the mixture over the base of the baking tray. The mixture should be about 1cm thick. Place in the oven for about 10 minutes or until golden brown. When it comes out the oven place the base of the paper on a damp tea towel and cover the top of the sponge with a dry one. This helps ensure that the base stays moist and will be easier to roll. When the sponge has cooled you can then add the filling! Depending on your choice you can do a variety of fillings but in this recipe we are explaining two options .. you can then invent your own dependng on your personal favourites! Drizzle the grand marnier over the base of the sponge. Add the 50g of thinly sliced candied orange to the butter cream along with the zest of 1 fresh orange. Spread some of the butter cream over the entire sponge, then carefully roll it up, peeling the paper off the back as you go. Place the log on a serving platter and then spread the rest of the buttercream over the top and ends. Using a fork make swirls so it look like a log … then decorate the top. We put some extra candied orange, some chocolate swirls and a plastic golden flower to give a nice effect. You can do a variety of things so get as creative as you like!! You could always add dark chocolate shavings inside, or outside to make it a chocolate/ orange combination too. Option 2: Chestnut and chocolate. Drizzle the licqueur over the base of the sponge. Whip the double cream until thick the fold into the chestnut purée. Spread the chestnut mixture over the base of the sponge then carefully roll it up, peeling the paper off the back as you go. Place the log on a serving platter. Melt the 200g of chocolate over a bain barie and when melted, pour a little onto some non-stick paper to make a plaque of about 10cm by 5cm and place in the fridge. Meanwhile whisk the rest of the melted chocolate into the butter cream and leave to cool again. Make a simple icing sugar and a tiny amount of water and food colouring to create a thick paste and using a thin nozzle and a piping bag, pipe Merry Christmas “Joyeux Noël”onto the plaque then leave to set again. When the chocolate buttercream is set, spread over the top and ends of the rolled sponge. Using a fork, make swirls so it look like a log … then decorate the top. We put some sugar stars, glitter sugar, and Christmas decorations (mushrooms and silver star) and the plaque on the bûche. There are so many things you can do, so add different sugar to look like snow and anything to create a Christmas feel. In boulangeries in France you can get some very contemporary, simple looking bûche and more decorative ones, so it is really up to you what you prefer. You can infuse the sponge with different flavours too to add another layer of flavour.